on the wagon where he suffered a fatal accident." Ariana is a 4th cousin who descends from William Merrill's daughter, Lucy, who is a younger sister to my 2nd great-grandma, Phoebe, as well as to Elizabeth, who is the woman who raised Phoebe's daughter, Eva, as her own. Eva is my Mom's maternal grandma who helped take care of Mom and her brother during the first years of their lives following the death of their Mother. 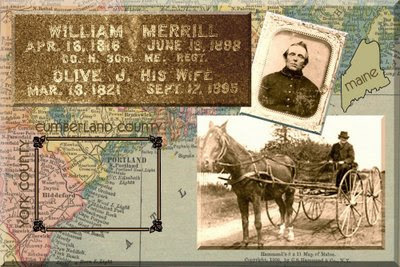 The two photos of William Merrill used in the above collage were shared by Ariana's mother, Dr. Susan Snow, of Maine. The upper left image is cropped from a poorly-done :( tombstone photo I took in 1998. Biddeford Daily Journal. Biddeford, Maine, Friday Evening, June 17, 1898. William T. Merrill died Thursday at his residence at Pine Point, aged eighty-two years and two months. He was one of the oldest inhabitants of Scarboro. Four sons and four daughters survive him. The funeral will be held Sunday at 2 o'clock at his late residence. Biddeford Daily Journal. Biddeford, Maine, Monday Evening, June 20, 1898. The funeral of William Merrill took place at his residence yesterday. Rev. Mr. Goodwin of Pine Point conducted the service and selections were sung by a quartet from Dunstan church. The attendance was large, and many beautiful flowers were given. The entertainment [sic] was at the Dunstan Corner cemetery. June 24, 1898. Pine Point, Maine. Mr. Wm. Merrill who fell from his work cart Tuesday, the fourteenth, died at his home Thursday night. It was thought at first he had received no injury, but at midnight he grew worse and continued to fail until Thursday night when he passed away. Mr. Merrill was eighty-two years of age, an old and respected citizen. He leaves eight children to mourn his loss, four sons and four daughters. His funeral was Sunday. Mr. Merrill’s wife died about two years ago. I always enjoy your old photos of your family...and the stories are so interesting!